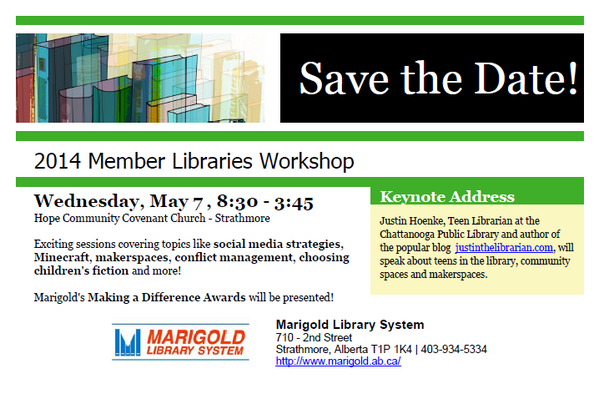 I am extremely happy to announce that I am heading up to Strathmore, Alberta, Canada to give the keynote address for the 2014 Marigold Library System Members Workshop. I’ll be presenting on teens, community, and makerspaces in the library. Thank you to the Marigold Library System for asking me to be part of their program. I am honored and SUPER excited to visit Strathmore! This is my first keynote ever…I am excited to move into this new chapter. Next Thank You Wisconsin Winter Web Conference!